Fact: At ShareProgress, we do a whole lot more than just our social sharing platform. Our creative team helps awesome progressive organizations build fun tools to make their campaigns even more effective. 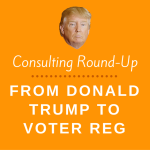 Most recently, we’ve helped rebuild Vote.org (send it to your friends who haven’t yet registered! 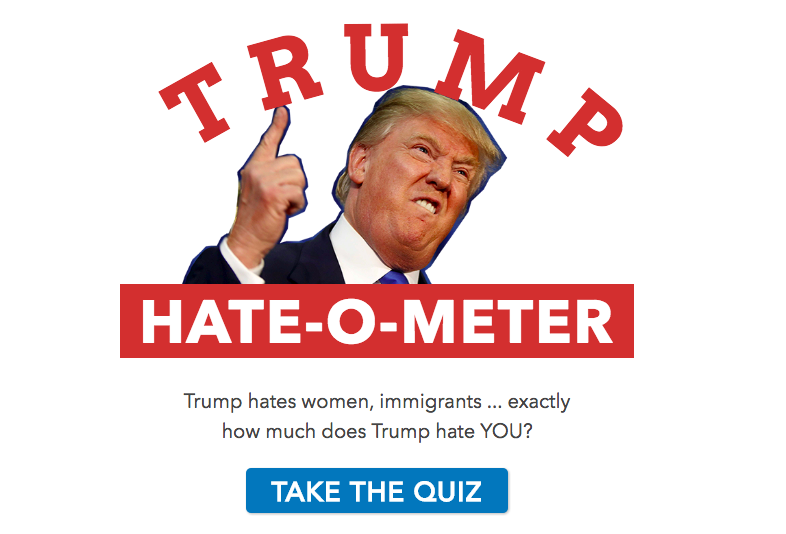 ), we’ve created a photo sharing site for Greenpeace, and we’ve helped NARAL to make a comprehensive quiz that tells you exactly how much Donald Trump hates you. I chatted with Cindy Phan, our Creative Director, about what it takes to get a campaign up and running, what her favorite part of our recent projects has been, and advice she has for organizations that aren’t sure if creative tech will be a good fit. What’s the process like for getting a campaign project up and running? It depends on the client. For these three projects, the clients came to with ideas already. But we’re also interested in plugging in when people are still in the brainstorming or strategy phase, and helping to figure out what kind of technology might make sense for their campaign. For example, Greenpeace already knew they wanted to create a photo sharing tool for their supporters. So we needed to think about how to do that–what’s the best UX? What’s the best technology to use? Then we write a proposal specifying our approach. When that’s approved, we do branding, design, and development–basically figuring out the look and feel of the campaign, how to represent the campaign or idea to the world. Our next step is to come up with the wireframes, which are basically the blueprint for the website. Once those are approved, we apply the branding to the wireframes, share that with our client, and then integrate the necessary technology to develop the project. When that’s done, we do a soft launch of the website, which gives everyone a chance to play with it and see what needs to change. Then we launch it! A screenshot from Vote.org, a project where we did development work. How are clients involved in that whole process? At every step, we share what we’re doing, and the client gives feedback. That ensures that it’s actually what the client wants, and then there’s no wasted time for anyone at the end of the process. We like to keep the lines of communication open so that clients really feel like they’re involved in the process rather than feeling like they’re just handing it off. They might also write all of the copy for the site (that’s what NARAL did)–or we might help them to write some of it. The homepage of www.trumphatesus.org, a project we created for NARAL. What are some of your favorite parts of the projects we just launched? They’re all really different projects, and they definitely all have different great aspects. Vote.org was a really cool project to work on because they’re basically the go-to place for absentee voter registration, so working with them to make their system even more effective was really exciting. Their project was a little different because we didn’t do the design work–we just did the development side for them. 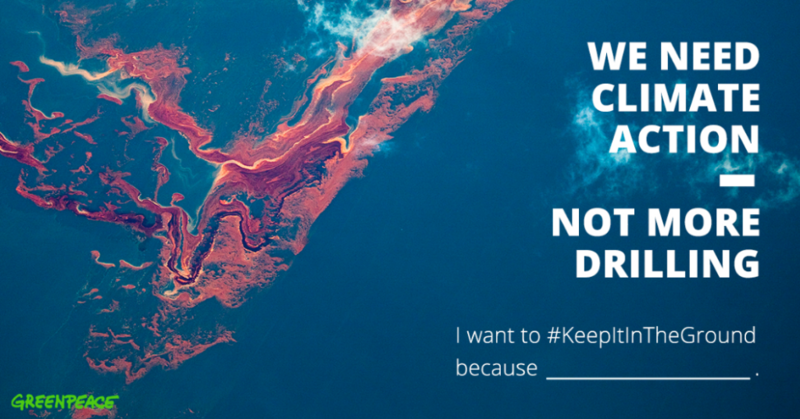 Greenpeace was fun because it was a little more personal, and more about finding a way to make their #KeepItInTheGround campaign engaging and not super technical. It also made us figure out the best way to actually build a photo generation tool, which we had never done before! A shareable image from the photo-sharing tool we created for Greenpeace. What suggestions do you have for organizations thinking about integrating creative tech into one of their campaigns? I’d tell them not to feel intimidated by the process. It’s easy to see a well-designed website or brand and think “It’s not possible for us to have something like that,” maybe because you’re not familiar with the design tech landscape, or because your team has never invested in that kind of thing. But it is possible! There are always ways to make it accessible, it’s just about working with the right people. We’ll talk to anybody, so if you want to start a creative tech campaign but you aren’t sure what do, we’ll sit and talk with you about what your campaign is, what the big picture is, what you want the project to accomplish. We’ll work with you to figure out project scope, ways to integrate design and technology–basically, we’ll find some way to make it possible. Also, campaign sites that are well-designed and well-developed are more successful. People engage more, and are more successful at learning from the information presented. So if you’re feeling stuck with how your organization has been running campaigns, integrating creative tech can bring in a breath of fresh air. I really like illustrated, interactive projects that convey high-level information in an engaging way. I love working on project where you’re finding ways to convey political or scientific info in a way that makes it easy for people to understand, and makes it relevant for them. Ready to make your own dream project come to life? Send Cindy an email at [email protected], and she’ll get you started!